Bird enthusiast Jay (Maisie Williams) happens upon a group of local boys who are using birds and nests as target practice for their slingshots. When she witnesses the group cause harm to a crow, she steps in and retaliates to get them to back off. As they scarper, Jay tends to the wounded bird and takes it home to try and help it recover. Her efforts fail but as she tries to bury it, the boys come back for revenge and set off a shocking and unexpected chain of events. Corvidae had its world premiere at Arrow Video FrightFest 2018 last month and in just 11 minutes, the short makes quite an impression. 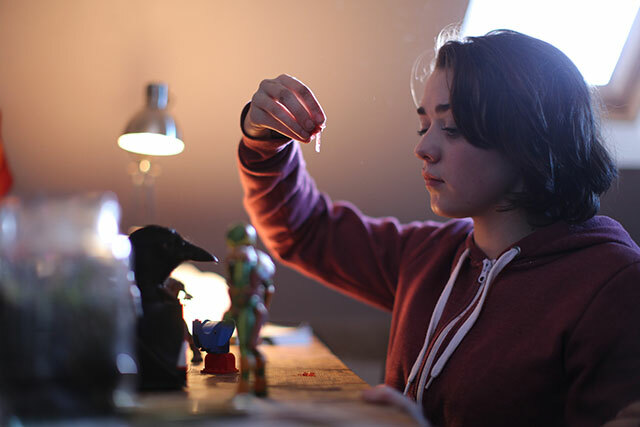 With Game of Thrones star Maisie Williams in the central role of Jay, the short was bound to get some attention, but after having seen it, I can say it’s worthy of the plaudits it’s been receiving. Featuring no speech, the short is surprisingly moving as it gives a little glimpse into a pivotal event from Jay’s life and her subsequent decision to take an interest in and care for birds. Told like a fairytale, Corvidae packs a lot into its short run time and the chilling final few minutes are pretty spectacular. I don’t want to give too much away as the element of surprise definitely works in its favour but what I can say is that writer/director Tom de Ville has certainly found some inspiration from Alfred Hitchcock’s The Birds. Maisie Williams is superb as Jay. She is able to convey plenty of emotion without uttering a single word and the short quickly gets you on her side. Her initial act is one of compassion and outrage after what she witnesses and Williams is magnificent. Her facial expressions and actions let you know exactly what Jay is feeling and it’s a fantastic performance. The direction from Tom de Ville is worth a mention too. It’s not easy to tell a story without words but he manages it admirably. There’s tension, emotion, drama and horror during Corvidae, making it quite the rollercoaster to watch. I must admit I’m not always a fan of shorts but Corvidae hit the spot for me. Superbly acted and beautifully directed, the short is as chilling as it is moving. Williams is such a wonderful actress and she really shines here. Dare I say it feels like this could be expanded into a full born feature in the future? If it is, I just hope Williams is on board.